I was approached by National Air Traffic Services (NATS) to create a series of campaign posters concerning air safety. NATS is the main provider of Air Traffic Control services in the UK. There was a problem with light aircraft straying into controlled airspace without permission and NATS urgently needed to educate pilots about the problem. Because of my aviation background I understood exactly what the problem was and I was given an open brief. I always find that humour, particularly ironic humour, gets a message across very well. Although this image is humorous it has a very distinct message; one could almost say that the image has impact! 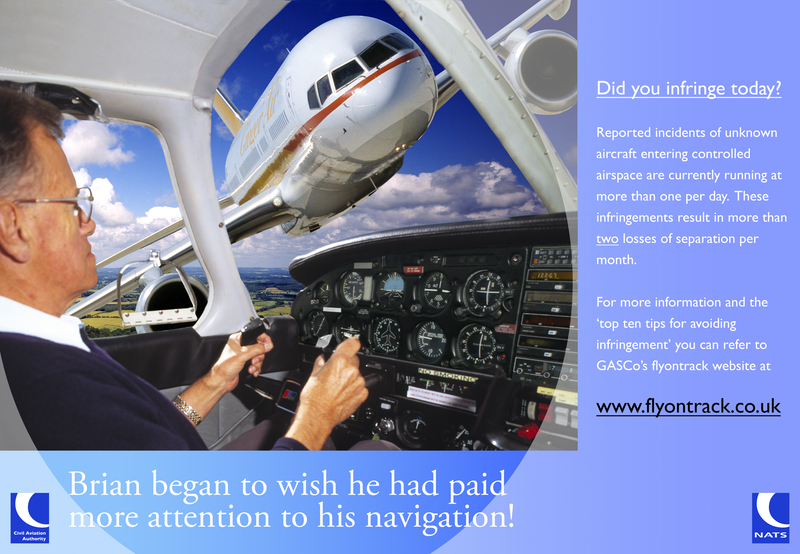 This was the first of a series of posters produced for this campaign and can be seen in Flying Clubs around Europe. I was even promised a copy in Hungarian but it never arrived. The ‘photograph’ was constructed from various elements. The ‘pilot’ is a non-flying friend (who, entirely co-incidentally, is called Brian) that I persuaded to go for lunch at my local airfield in exchange for photographing him in the left-hand seat of a light aircraft whilst it was sitting on the ground. The photograph was opened in Photoshop and the windows cut out. Then a view of some clouds was dropped in and instrument panel indications were adjusted to suggest that the aircraft was actually in the air … Brian was now flying! In my photographic archives I had a near head-on shot of a Boeing 757 sitting on a taxiway whilst starting its engines. This was isolated, its undercarriage removed and then dropped into the main image; change the colour scheme so that the original airline could not be identified then it was rotated to get a steep angle of bank and the main part of the image was complete. After the main image was completed the poster itself had to be designed. This design became the template for the following posters in the series to give a sense of continuity.